Scheduled for launch on November 7, 2016 the generation next Fortuner has started reaching its dealers across the country. According to industry reports with new avatar of Fortuner Japanese car maker intends to entice the Fortuner enthusiasts to bring their beloved SUV during festive season. The sources of company have informed that stocks of erstwhile version of Fortuner have been phased out by dealers within country and buyers booking the new Fortuner will be delivered their vehicle before the end of festive season. 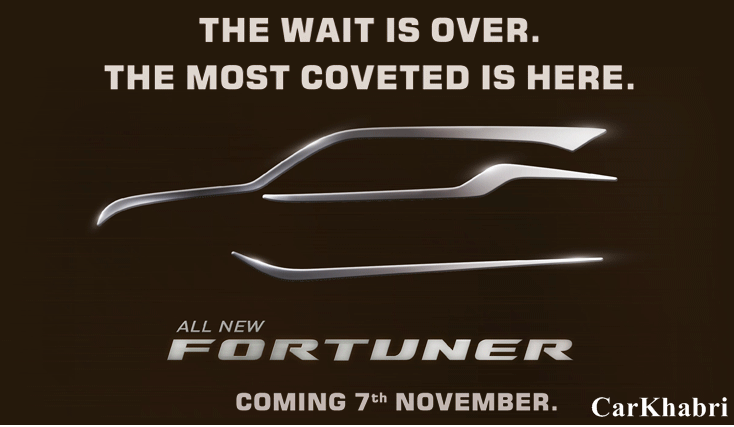 It is reported that most of the dealers have already commenced the bookings of Fortuner with the down payment of Rs. 1 lakh. The new Fortuner is reported to be developed on completely new ladder chassis and emboss new design philosophy. The engine options offered in 2016 Toyota Fortuner will include 2.7 litre petrol engine which also powers the Innova Crysta, boosting the power of 166 bhp and torque of 265Nm, while the diesel variant will host two engine choices of 2.4 litre and 2.8 litre developing the power of 148 bhp and 175 bhp respectively. The transmission system will include five speed manual gear transmission system followed by an option of six speed automatic transmission system. Moving inside the new Fortuner you will realize the Japanese car maker has tried to enhance the premium feeling of interior to next level with plethora of remarkable features including automatic air conditioner, multi-functional steering wheel, TFT multi-information display, one touch folding for second row seats, electronic tailgate, push button start and stop, Optitron instrument cluster, paddle shifters, cooled glove box, eight way power adjustable driver seat and many more. It is believed that going through the integration of contemporary feature, Japanese car maker will price the new Fortuner little bit costlier than its outgoing version.